Shreveport Symphony Orchestra / standing ovation, a photo by trudeau on Flickr. 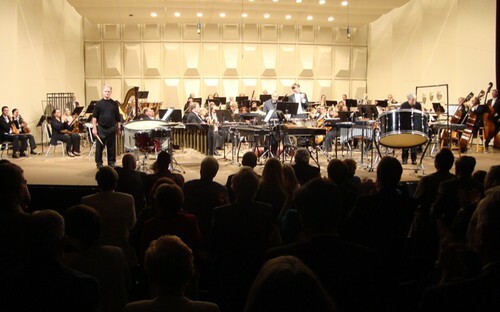 The Shreveport Symphony Orchestra finished its season with a standing ovation. Ending with a flourish meant filling the stage with bass drums, marimbas, diverse cymbals and additional types of percussion devices. The concerto, "The power and the glory," featured principal percussionists Chan Teague, Doug Parmelee and Anthony Robinson. By the way: there were 2 additional percussionists who were performing as part of the orchestra. Having regained its momentum with a 7-concert season, the SSO moves to 8 major performances next season. Check out the SSO dates and performances. Wouldn't it be brilliant if more cultural organizations began to approach the orchestra for synergistic event planning and marketing opportunities? 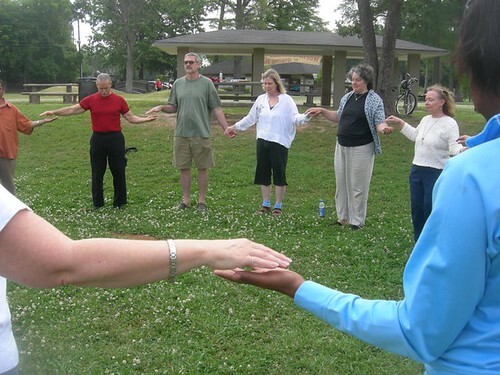 World Tai Chi & Qigong Day, Shreveport: energy circles, a photo by trudeau on Flickr. The 13th annual celebration of world t'ai chi and qigong day is celebrated by over 65 nations on multiple continents beginning at 10 a.m. in new zealand and in every consecutive time zone at 10 a.m. in each time zone, says Sifu Janis Gabriel. This is a celebration of life, health and healing, peace, compassion and the sharing of incredible energies planet-wide! "In shreveport there will be multiple celebrations," says Gabriel. "Our celebration this year will be behind the Barnwell center. i will be there from 9 a.m. to greet people and lead warm-ups and qigong. at precisely 10 a.m. we will begin t'ai chi..........it does not matter whether or not you practice our form (yang, short form) ~ any and all t'ai chi, as well as mellow flowing movement in general will be awesome. no prior experience is necessary ~ just come and have fun! wear comfortable clothing and shoes and bring water for personal use." 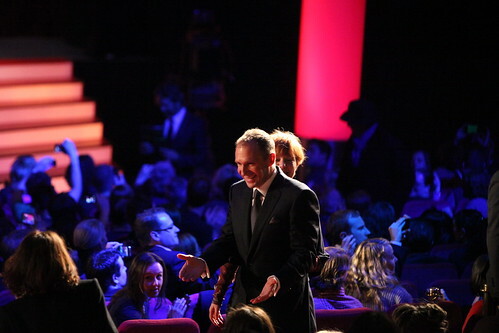 Ralph Fiennes, a photo by cinematographer on Flickr. Good writing remains good writing, some 400 years later. That's one of the lessons to take away from the Ralph Fiennes movie version of Shakespeare's tragedy, Coriolanus (1605). It's a smoking, muscular movie about war and pride and a warrior and his mother. The sweat of Fiennes plays against the majesty of Vanessa Redgrave, abetted by the towering Gerard Butler and decorated by Jessica Chastain. Indeed, it is superbly cast. Fiennes has also swung the most active cameras I have seen and found a drum-minded composer that ripped the air. Highly recommended at Robinson Film Center. Ruby Jane, a photo by McB! on Flickr. Seventeen-year-old Ruby Jane is the real musical deal, says Jim Huckabay. Born in Dallas, she is a fiddler, singer, songwriter, and multi-instrumentalist bandleader of the "Ruby Jane Show" showcasing her distinctive Americana mix of country, jazz, bluegrass, and blues. 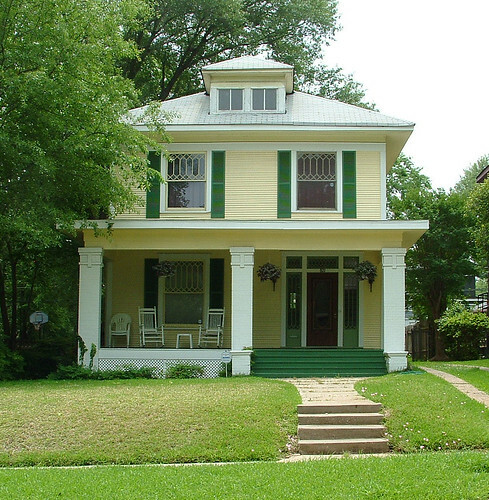 With deep family and cultural ties to Mississippi and where she lived for her first twelve years, she now resides in Austin, Texas. > Reservations highly recommended for this show at www.shreveporthouseconcerts.org, by email: reservations@fairfieldstudios.com or by phone: 318 219-7688. Saturday, April 28, 7 pm at Fairfield Studios, 1510 Fairfield Avenue. 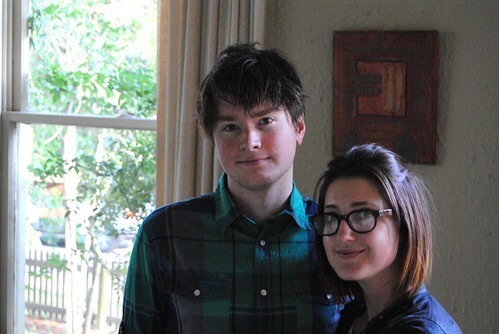 Evan Falbaum, Erica Callais, Shreveport , a photo by trudeau on Flickr. In the movie-mad city of Shreveport, there's another opportunity to be part of the film making energy: visit Indieagogo.com to check THE Total Human Experience. From Evan Falbaum, the writer/director of "Getting Outer Space," comes a short film about the future of social networks and how we're on a path to share our personal experiences with greater detail and realism than ever before, says Moviesauce. The film explores the hypothetical technology and the potential impact of it, while drawing parallells to many modern tech companies. The short film is in competition for the Louisiana Film Prize, where the goal (apart from making an awesome short film) is to win $50,000. "Produced by Moviesauce, we have an experienced crew of filmmakers who have both worked together on previous projects and have solid film industry experience," says Falbaum. Scriptwriter-director Falbaum and producer Erica Callais have a kicker: "We're so eager to have your support that if you donate to us and we win the LA Film Prize, we'll not only return your investment, we'll give you 50% of what you gave us on top of that. You give us $10 and we win? We'll turn around and give you $15 of the prize money. We're that serious that we're willing to give up a portion of our potential winnings just to return the favor. This isn't simply an opportunity to help us. It's an investment." Crowdsourcing? Falbaum and Callais are soliciting your personal videos for use in their film. Send footage to ericacallais@me.com. Butterman and Poling of the SSO, a photo by trudeau on Flickr. "Join us on Sat., April 28, for our season finale as we honor Concertmaster Kermit Poling," says Michael Butterman. 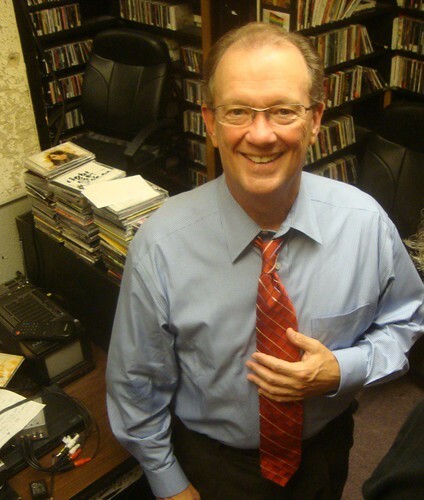 "It's his final concert with the Shreveport Symphony Orchestra after 27 years of performing!" Poling will entertain with the glorious Violin Concerto by Samuel Barber. The SSO Percussion Trio will perform Russell Peck's The Glory and the Grandeur, a unique, energetic concerto wiith toms, snare drums, gongs, xylophones and marimbas. 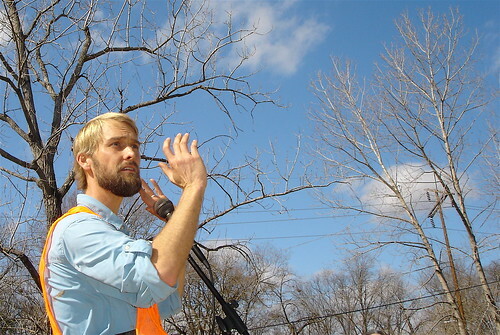 Shreveport Clean Up: Montessori / Anderson Island / Stoner Hill: Jon Soul, a photo by trudeau on Flickr. "The first 90 mile leg of the Bayou to Bay project is complete," says Jon Soul. "This leg, leaving from the Ockley bridge in South Highlands-Shreveport and paddling to the Red River in Natchitoches, took six glorious days on Bayou Pierre." Jon Soul and videographer Dan Furst are offering 2 presentations on the Bayou to Bay trek. Friends of Red River National Wildlife Refuge -- Monday, April 23, 6:30 p.m. The meeting will be held in the (new, amazing, and conveniently located) Environmental Education Center at the Red River National Wildlife Refuge Visitor Center, 150 Eagle Bend Point (at the end of Sunflower Road), Bossier City, LA 71112. For detailed directions, go to http://www.friendsofredriver.org. Also, on May 15: The Bayou Chapter of the Ozark Society -- Tuesday, May 15, 6:30 p.m. The meeting will be in Mickle Hall in the Carlisle Auditorium on Centenary Campus on the first floor. For detailed directions, go to http://www.bayouozark.com. 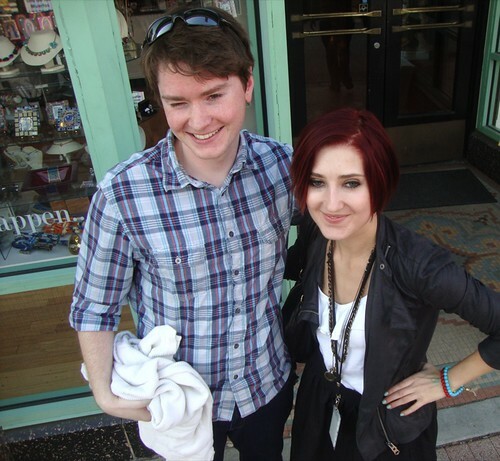 Evan Falbaum, Erica Callais, Shreveport, a photo by trudeau on Flickr. "Take a minute and imagine that in the future you have the ability to share your experiences with other people. Not just pictures and videos, but the entire emotional experience is captured and can be sent to other people to experience exactly the same way you did," writes Evan Falbaum. "You can record whatever you want. Say you really enjoy cutting grass. It makes you happy. What if you could bottle that experience and the feeling you get from it? Now, over the next two months (that is before July 1) if you experience something that you hypothetically would want to share with the world, be it a concert or a party or a date or a road trip or skydiving or cooking or tying your shoes or playing with your dog or going to the dentist or putting on a performance or writing a novel or painting a house or anything, and you have the means to record it - even just 10 seconds of cell phone footage - you can send it to Erica at ericacallais@me.com and it'll be used in the movie. If you can also include a brief description of why this moment or thing or activity is significant to you, that would be a plus. Good. It will be. Send whatever you want. We need a lot of stuff." Spring Awakening @ Centenary College / Randy Schmidt, a photo on Flickr. "This is an incredible cast and an unbelievable director in Alan Souza," says actor Tom Serio. 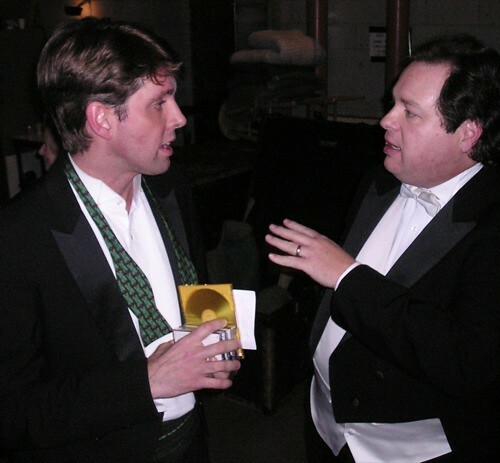 "And of course one of the best set designers in the country in Don Hooper and tech director Alan Berry. And it all comes together in Spring Awakening at Marjorie Lyons Playhouse in such a moving and magical way. Come see us Thursday, Friday, or Saturday at 8:00. You don't want to miss this. I get to beat up on Andrew Wood and Joe Signorelli and be otherwise vicious and cruel with my Fraulein K (Ms.Glorioso). — with Emily Slazer, Josh Rabalais, Chelsea David, David Daniel Burch, Sandy Rather, Lauren Morrison, Andrew Wood, Barry James Acosta, Nathan Gauthier, Maddison Gilcrease, Emily Hay and Chelsi Hefner." Performances Th, Ap 19, Fri, Ap 20, Sat, Ap 21 at 8 pm. 8:00. $18 for adults, $12 for students, $15 for seniors and active military. Shreve Memorial Library Main Office - Shreveport LA 156_5700, a photo by yahcatphotos on Flickr. The Shreve Memorial Library system in Caddo Parish says they will have to shut down all 21 libraries if 2 items on Saturday's ballot do not pass, says ksla.com. One item goes towards buying new books and supplies; the second goes to the operating budget. The Caddo Parish Tax Assessor estimates if they both pass it would cost the average Caddo Parish homeowner about $70 a year. "These propositions are vital to the library. They are not new taxes. Your taxes will not go up," said Shreve Memorial's Ivy Woodard-Latin. Tom Hundemer, Shreveport, a photo by trudeau on Flickr. Les Cors de la Louisiane, a horn quartet made up of university faculty and professional musicians from North Louisiana, will perform at Centenary College, Anderson Auditorium, Hurley Music Bldg, at 7:30 pm Th, Ap 19, says Susan Rogers..
Members are Dr. James Boldin (ULM), Dr. Kristine Coreil (NSU, Shreveport Symphony), Thomas Hundemer (Centenary College, Shreveport Symphony), and Craig Pratt (Shreveport Symphony). The quartet will perform several selections on the second half of the program. Green Stock Fest, Shreveport, a photo by trudeau on Flickr. 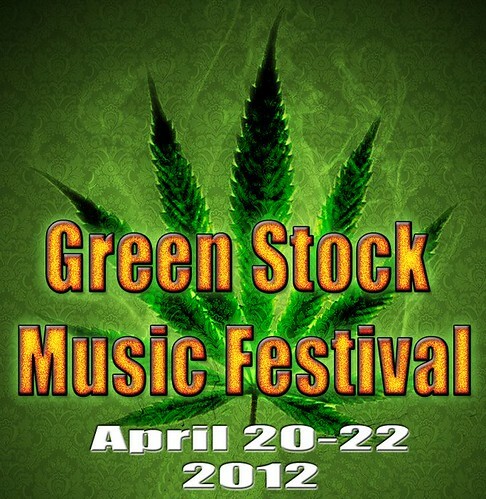 Green Stock Music Festival is a three day outdoor fest featuring top regional bands, says Kenneth LaBorde. Inspiration for the fest comes from a fervent desire to see marijuana decriminalized, says the professional musician. Musical acts performing over the 3-day fest will be announced soon. But with Nashville singer-songwriter Vernon Rust committed on the Green Stock FB page, it is apparent that the line-up will be heavy. It will be held in a field surrounded by woods adjacent to a motorcycle shop called The Leather Shack, 5544 Greenwood Road (between Monkhouse and Pines Rd), Shreveport, on April 20, 21 and 22. It will also be streamed across the globe via Livestream, says the producer. Green Stock Music Festival advocates the decriminalization of marijuana for responsible adults, legal access to medical marijuana for patients who could be benefited by cannabis, and legal domestic hemp production. Tickets are $10 per day or $25 for all weekend. You must be 18 or over to attend, proper ID required for entry to the festival. "Earth Day Fest at Sankofa Gardens is this Saturday, April 21, 9:30 AM - 2 PM. See you there. Film by Conley Hataway," says Leia Lewis. 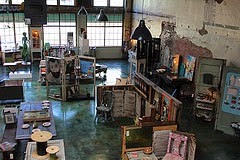 Sankofa Vision Inc. from ConleyHataway on Vimeo. 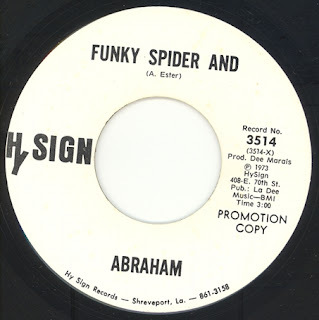 “‘Funky Spider’! You haven’t heard ‘Funky Spider’? Here, have one of my extra copies.” I remember Dee Marais exclaiming this when we conducted a series of interviews back in 2007. After excitedly yelling “Funky Spider,” his voice dropped down and he slowly said, “and the scared fly.” Then, he grinned and started laughing. Such was my introduction to this Shreveport funk record. 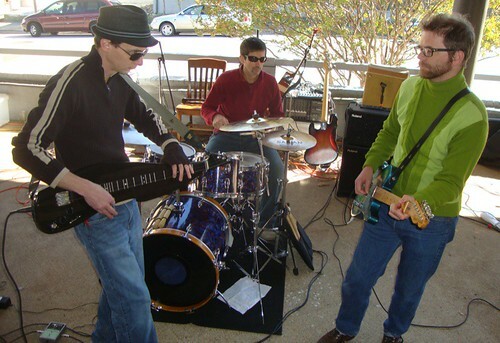 Twang Darkly: Michael Futreal, Troy Messina, Joel Boutlinghouse, a photo by trudeau on Flickr. The Downtown TNT Trolley Tour this month will explore Architecture with tour guide and local history guru, Lane Calloway, says Bonne Summers. 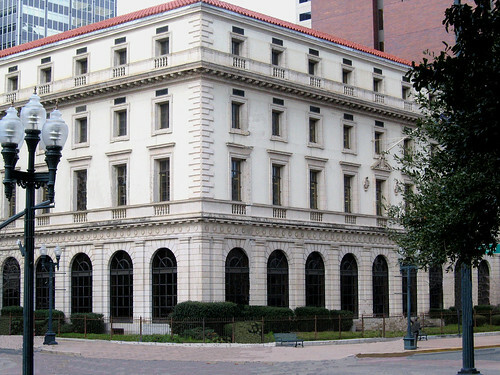 A tour of downtown Shreveport will explore why Shreveport has so many Italianate buildings, who built them and why. Stops include The Strand Theater and The Novena – but Lane will speak about many other buildings in the one-hour tours. Narrated tours: 5pm-6pm, 6pm – 7pm and 7pm-8pm. – all begin at artspace. Plus Sheriff Steve Prator's Angola Prison Rodeo Poster "Limited Edition" Signing at 5:00 pm - 7:00 pm, benefiting the longest running prison rodeo in the country. And there's a Twang Darkly CD Release Party. Having heard the new CD from the trio Twang Darkly, The Sound of Secret Names, I can vouch that it is an excellent piece of work. It is not your typical Shreveport music, being inspired by Appalachian sounds as well as by rock, blues and more. It is instrumental music - the lead voice is typically dulcimer, guitar or banjo. Overall, it sounds Celtic but there are some driving and bluesy riffs in the mix. 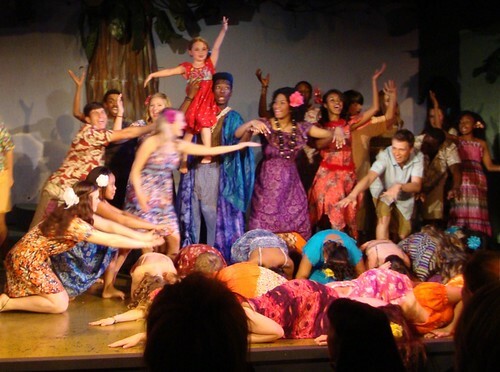 Once on This Island / Academy of Childrens Theater, Shreveport-Bossier, a photo by trudeau on Flickr. 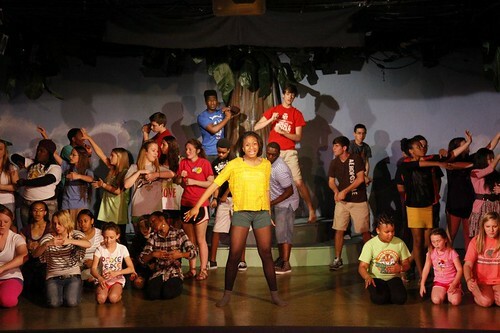 Undulating, sweet-sounding kids literally filled the stage at East Bank Theater on opening night of Once On This Island. It seemed impossible to resist their joy at being on stage and having a Caribbean story to tell. It's a compact show - one hour, twenty minutes on opening night - by the Academy of Children's Theater, and one in a consistent line of hit musicals from directors Cynthia Whitaker and Lauren Ross. The packed theater was borne upon the music of the excellent 3-piece orchestra led by Daniel Ley and the voices of lead vocalists Nia Savoy, Trey Jones, Cara Watson, Brianna Richmond, Josh Meyers, and Kolby Ledbetter. Literally, everyone sings well. And ACT has admirable depth. Highly regarded performers such as Christian Dantes, Courtney Van Eaton, Thomas Keys and Jori Jackson brought uptown vibe to lesser roles. Highly recommended for the incomparable comfort of watching the youth of our city develop a professional and winning performance style. From the ACT FB page: "Another sold out show!!! You don't want to miss Sunday's performance at 2pm and due to overwhelming demand we have added another show on Saturday April 21st at 7pm...at East Bank Theatre. Call today to get your tickets!! 318.741.8310"
Once Upon This Island, Academy of Children's Theater, a photo by trudeau on Flickr. "You do not want to miss this award-winning cast," says Lauren Ross of the Academy of Children's Theater version of Once Upon This Island. Meet the amazing gang of singing, dancing cast members at the Academy of Children's Theater Facebook. Tickets are $15 at East Bank Theatre. Performances: April 13 and 14 at 7 pm and April 15 at 2 pm. Wilkinson St, a photo by Wilkinson St on Flickr. The historic Highland neighborhood will open its doors to the public for a most unusual event on Sat, May 19, from 11am-3pm, says Liz Swaine. Highland BLOOMS is not your Mother’s garden tour…it is going to be a surprising, intriguing, filling, artistic and musical event. The gardens of seven Highland residents will be open to the public. • Alan and Erin Berry at 702 Prospect will show their farm-style organic vegetable garden-in-the-city. • Dr. Ted and Lisa Warren at 937/947 College have a space with a decidedly British flair—their English style garden with wisteria, pergola and water fountains will feature live music by jazz musician Anya. • Jean and Steve Kemp at 1045 Dalzell will show how a shade-loving yard can become a blooming showplace. • Jodie and John Gharbi at 833 Prospect have a backyard that will surprise. • Howard and Sarah Scott at 2300 Creswell make every square inch count in their ‘postage stamp garden’. • Ken and Zoe Meeks, 664 Stoner, live in the much-talked-about ‘old fire station’ in Highland. • Liz Swaine and Steve Culp, 2102 Southern Avenue. Liz and Steve’s fun space has grown over the years to include raised beds, a grapevine-draped pergola, art installation, a container garden and a Victorian potting house. Visitors can stop and sit in this garden to enjoy live music by the band Tchai and have the opportunity to peruse the wares of area artists, all of which will be for sale. Got advance tickets to The Highland Experience April 15 at www.thehighlandexperience.org for $10. Tickets will be available the day of the event at C&C Electric and Lighting, 2430 Line Avenue, for $13 and at all the gardens on the tour. **RAIN DATE for Highland BLOOMS is Sunday, May 20.
www.restorehighland.com and join us at Highland Restoration Association on facebook. Elliott Stonecipher, Shreveport , a photo by trudeau on Flickr. Now that we are on the backside of our state's "education reform" event, we can begin considering what the "reform" rush has wrought. To put it another way - and with due credit to U. S. House Minority Leader Nancy Pelosi for her marvelously honest description of really stinky legislative process - now that these laws have been passed, maybe we can find out what's really in them. An excellent summary of what has happened to date is a recent piece by Jim Beam, writing for the Lake-Charles American Press (SEE column here). My thinking about this 23-day piece of Louisiana history is not yet focused on the substance, not really. I am, instead, still stuck on the politics and on reading our governor's tea leaves, a good skill-set for those of us trying to figure out what Gov. Jindal is ever really doing. Yes, inarguable facts are staring us down: the bills will be educational law for a very long time; wide-ranging reform of our public education system has long been necessary; even the best of teachers are justifiably angry at the "how" even if not the "what"; and, related court challenges are ahead of us, etc., etc. To me, though, there are many other things to note as we figure all of this out. For one, the timing is still creeping me out. Those of us keeping up with what happens behind the political curtain have a bad feeling of deja vu on that score. I've written about it enough, and won't belabor it, but the fact is Governor Jindal strong-arms these "reforms" through a pre-leased legislature each time he's hoping to be the vice presidential candidate on his party's ticket. Ramping up to the 2008 presidential election it was "ethics reform," and four years later as we gird for the 2012 campaign it's "education reform." The problem is, "ethics reform" was no such thing. It was, rather, a huge political show for a national audience which, back here on the farm, put governors and legislators in charge of ethics enforcement. That is never a good thing anywhere, but maybe especially not in Louisiana. For those who keep up, we know our governmental ethics regime was not reformed, it was hammered into submission by those who are, or figure they might be on any given day, unethical. One way or the other, Gov. Jindal isn't likely to be living in Louisiana when we struggle with our newfound, quasi-public school system. That's never a good thing. It's the opposite of skin in the game. It's more like drastic change on the ground and changer-in-chief in the wind. 'Truth be known, former teacher that I am, I cannot in good conscience claim that the outlines of the governor's plans don't make sense ... they do. I can, though, say this very clearly: when a governor or mayor or any other governmental executive is about to change the legal basics of the employment status of tens-of-thousands workers, he or she must, as a good and decent human being, find more than 23 days to do it ... many, many more than 23. When a governor is going to take money we pay in taxes specifically for our local public school systems, and re-route it into the rising checking account balances of non-public schools, he or she has to find more than 23 days to explain and sell it to those whose checking account balances decline in the transaction. Explaining it only to the aforementioned pre-leased legislature doesn't cut it. While he or she is at it, he or she has to fully disclose the identities of those who are by any definition enriched in this process, e.g., who really, financially, benefits and how? I could go on, but I don't need to for anyone who's reading this. I think we all know what I'm saying: there's something automatically not right when major social, cultural and political change is accomplished by steamrolling any opposition. That is especially so when no one can yet tell us why this had to be done so quickly, with debate so limited. Unless memory fails me, that is precisely the point Gov. Jindal and many others in his party made - and still make - about how President Obama committed the same huge mistake with his Affordable Care Act, now known as Obamacare. Gov. Jindal was right in that criticism of our president's health care "reform" which may or may not yield any such thing. Thus, Gov. Jindal is wrong in what he's just done. Elliott Stonecipher's reports, essays and commentaries are written strictly in the public interest. No compensation of any kind has been solicited, offered or accepted for this work. ASEANA Spring Festival, coming April 30, 2011, a photo by Shreveport-Bossier: Louisiana's Other Side on Flickr. The 5th Annual Aseana Spring Festival is back again, 11 a.m.-5 p.m. Sat, April 14, says Mary Grace de Joya Vea. It takes place at the corner of Milam and Texas Avenue in downtown Shreveport. The Aseana Fest and the Texas Ave Maker's Fair blossom next door to each other on Ap 14. Both are free. Parking is abundant and also free. This year the Aseana event, hosted by the Aseana Foundation, will celebrate Korean culture with the theme: Korean Arirang Spring Festival. The festival will include various Korean exhibits and DVD screenings that showcase Korean culture; Korean letter brush text, a Korean Kimchi-making demonstration; Korean cuisine, live performances and more. The performance program will begin at 12:30 p.m. and end with a grand finale performance of the Samul Nori, a traditional genre of Korean percussion music. 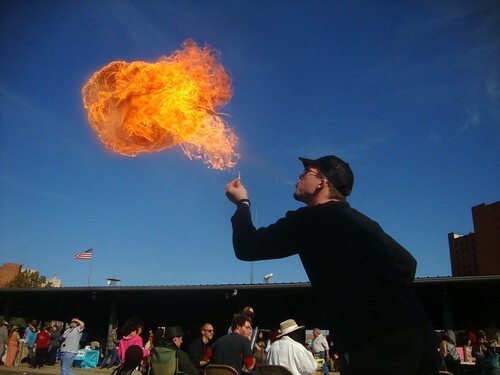 Maker's Fair / Shreveport / Nov '11: Peter Fetterman, a photo by trudeau on Flickr. Jewelry, paintings and sketches, furniture, honey, candles, notecards, things made from metal, string and recycled soy: the Texas Ave Maker's Fair offers shoppers a multifarious market. Pastries and heartier fare allows visitors to brunch as they wander. Admission is free and free parking is all around the site. 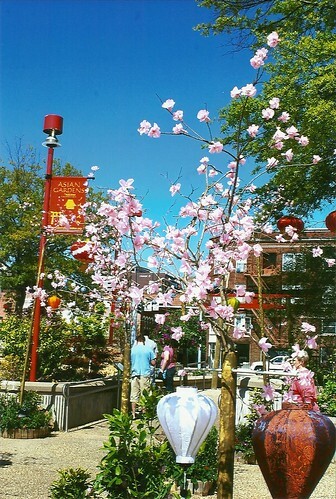 Adjacent to Maker's Fair is the Aseana Spring Festival. More entertainment and exotic food awaits - from 11 am to 5 pm - at this elegant fest. Also free, the Aseana Fest features the culture of Korea in arts and eating. Sited at the corner of Texas Ave and Common St - adjacent to the First United Methodist complex - a walk around the Maker's Fair / Aseana Fest neighborhood will be a tonic. Across Crockett St, the Central Fire Station is being renovated as the Central Arts Station, new HQ for Shreveport regional Arts Council. A few steps away at 846 Tex Ave is minicine?, long a vibrant location for avant garde arts in the city. Across Milam St is the spanking new Emmett Hook Center for drama built by First United Methodist. Nearby are historic Oakland Cemetery and the vibe-heavy Municipal Auditorium. Two blocks away is Millennium Studios. Go on bicycle? With backpack for bringing home the goodies? Maybe, baby. 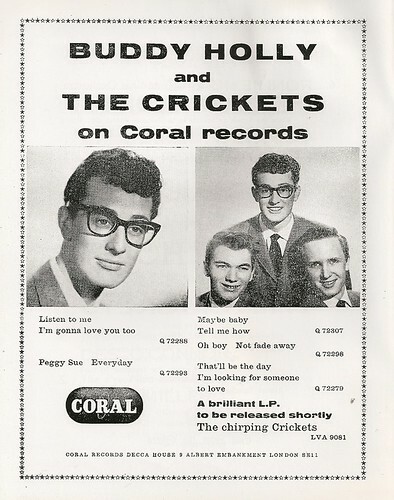 06 - Advert - Buddy Holly & The Crickets on Coral Records, a photo by Bradford Timeline on Flickr. ""For us, it was more of a rock 'n' roll kind of thing," Jerry Allison said. "Other guys were more interested in country than Buddy and I were. We started listening to rock music," taking advantage of the radio "skip" phenomenon that lets listeners tap into faraway stations. "It was kind of hard to find, but we could get a station out of Shreveport [La.] when all the other radio stations would go off at dark," Allison said. "We'd sit around the fire and listen to 'em." Those tunes were the inspiration for "That'll Be the Day," he said. Curtis could even name the day that the band shifted to rock: Jan. 7, 1955." From a Chuck Yarborough story at Cleveland.com. As power brokers in Shreveport and Louisiana politics manhandle the political process in regards the completion of Loop 3132, the paper trail is being followed by Elliott Stonecipher, spokesman for Finish3132.com. 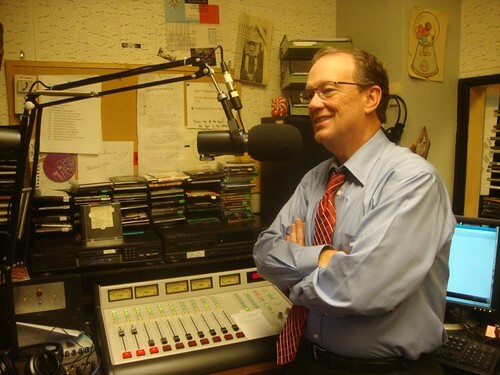 Stonecipher, a demographer and political analyst of considerable background, will chat with Loren Demerath and Carolyn Manning on Time for A Better Shreveport. Topics may include state issues and background on Gov Jindal's recent initiatives. Pastor Brady Blades Sr. dabbed a handkerchief to his sweaty forehead and gazed across the pews inside First African Baptist Church. "I can't believe this many people showed up to hear the gospel music," he said, and added a little joke: "There's something wrong with you people." 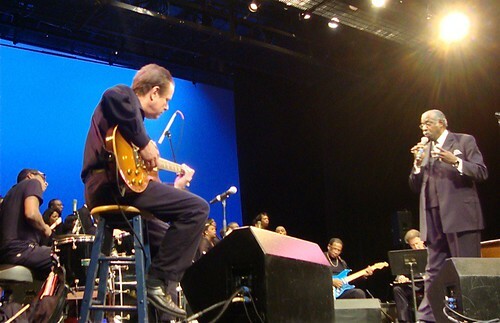 Saturday night, the historic sanctuary held a capacity crowd of 720, there to see and hear the 72-year-old Blade and his touring show, the Hallelujah Train. He's been the pastor at Zion Baptist Church in Shreveport, La. for 51 years, where he's just as legendary for his baritone singing voice as his fiery sermons. The Hallelujah Train includes Blades, his church's 27-member mass choir and their musical director and organist, Sereca Henderson. 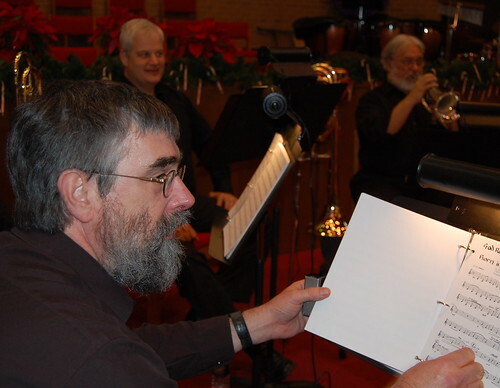 It was a full-throttle, praise-the-lord gospel music revue, augmented by a soulful rhythm ‘n' blues band that included the pastor's two drumming sons, Brady Jr. and Brian, and a couple of big names in Americana, jazz and country music. This wasn't a "musical ministry"; the pastor kept his between-song patter to a minimum, and after every third or fourth song he sat down to have a rest, wipe his forehead, and let a member of the chorus take a solo. The best of these was 80-year-Ada Smalls, a 51-year member of the Zion Baptist congregation, who belted "Surely God is Able" like a young and possessed Shirley Caesar. Blade, with the power of the choir behind him, sang about baptism ("Take Me to the Water"), the inherent benefits of faith ("Give Me Jesus," "The Lord Been Good to Me") and his own advancing age ("This May Be My Last Time"). He delivered a beautiful rendition of "Amazing Grace." It was stirring, and every time Blades let loose with a wicked wail (a little Al Green, a bit of James Brown and a double-shot of Screamin' Jay Hawkins), the foundation shook, in the building that's been a cornerstone of black Christian faith in Savannah since 1859. First African, ironically, might not have been the best choice of a venue in which to present the Hallelujah Train. Those sitting jammed in the balconies couldn't see half of the performers -- and because Blades sang while standing on the red carpeting directly in front of the stage, he was not raised, and the sightline from the back of the room was virtually nonexistent. Not that the guest musicians - Daniel Lanois, Buddy Miller, Greg Liesz, Jon Cowherd and Chris Thomas - were chosen for their good looks. But they were, all of them, seated on the floor behind the pastor. Musically, the poker-faced Liesz was the standout, playing soulful pedal steel, lap steel and Dobro. Miller sang lead on the country gospel ballad "Wide Wide River." Lanois, playing a gold Gibson Les Paul guitar, mostly stuck to chords and the occasional R&B riff. The irony of singing these songs of praise, salvation and hope in a difficult world to a mostly-white audience that paid $40 or more per ticket was not lost on the pastor. "Are you all rich folks?" he asked. No response. "Do we have any poor folks here?" Nervous laughter, a few raised hands in the front row. Blade pointed to them. "You white folks poor?" he asked. The music was great, the singing inspired, but things never really caught fire; it was a concert performance, not a revival meeting. Nobody suddenly and loudly accepted Jesus into their heart; there were no blissed-out walks to the altar for spontaneous sin-cleansing. Actually, that would have been kind of cool.